On April 25, 1986 the area surrounding Chernobyl was full of action. The following day, everything came to a halt when Chernobyl Reactor #4 blew. Millions of dollars in land and equipment were left as people simply hoped to escape with their lives. 25 years later with satellite and internet technology, we can explore the ruins of Chernobyl and its surroundings from our home computer. 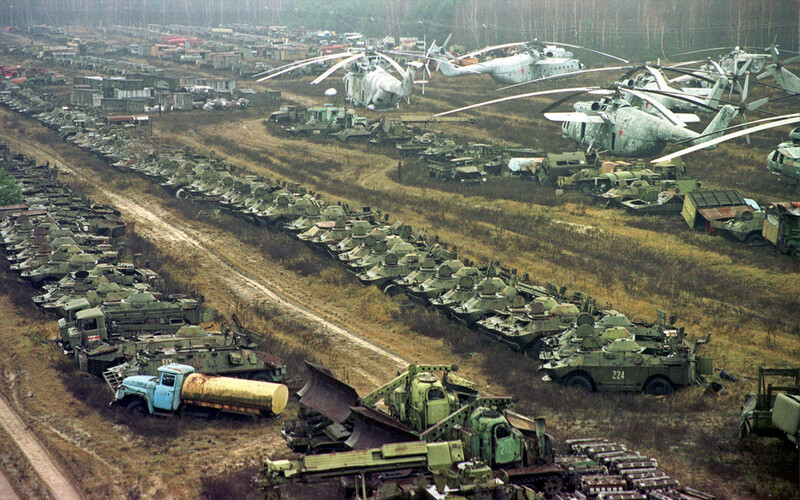 The vehicle graveyard is located about 20km to the southwest of Chernobyl. Hundreds of contaminated fire engines, tanks, helicopters, and other emergency vehicles used during the rescue and containment efforts have been left for dead here, as they can no longer be safely operated. This includes some of the helicopters used to establish the sarcophagus capping reactor #4. Officials recently arrested someone trying to steal a helicopter from the vehicle graveyard for use as a cafe. This is the famous Reactor #4 which exploded and put Chernobyl on the map. It’s now covered in concrete to minimize the spread of radiation, and it will need to remain so for a very, very long time. If you visit Chernobyl on a tour, they’ll take you out front of this reactor where there is a memorial for those brave workers who sacrificed their lives to safe others. Dozens of boats wrecked and left to the elements inside the Chernobyl Dead Zone. Some of the boats look like large tankers, once very expensive, now radioactive and worthless. Known as Chernobyl-2, this once secret Soviet Radar Station has been abandoned since the Chernobyl accident in 1986. You won’t find this radar station on any topographical maps, there was no evidence of any sort of useful building on the location. Some maps apparently were showing childrens playcenters and things of that sort instead. Only 2 of this type of secret radar station existed in the whole USSR! Since the accident the station has been decommissioned and abandoned, with many of the parts and materials removed or looted. One of the most haunting and famous images of the Pripyat ghost town is the ferris wheel. Pripyat had schools, rec centers, this small amusement park; there were children living here. Just below the ferris wheel you an see 2 other rides. Located about 15 km down river from the reactor, was used for launching the rescue helicopters. Can’t be sure exactly what this is, but it looks like an abandoned warehouse to the north-west of the Chernobyl Reactor. The parking lot is still full of cars . The dead zone goes on for miles and miles, all the way up, and well into Belarus. 1 response to "Abondoned technology in chernobyl"